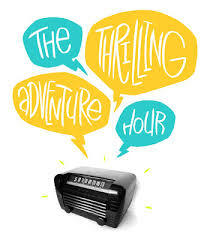 The fake radio show finally became a real radio show of a sort, when The Thrilling Adventure Hour began podcasting in January 2011, bringing the show to an even wider audience. The musical episode (The Piano Has Been Drinking) is a fan favorite. Andy has written songs and score for the show since it started in 2005. New live shows are performed every month at Largo at the Coronet in Los Angeles and sell out months in advance. Regular guest stars and cast members include Nathan Fillion, Paget Brewster, Busy Phillips, Autumn Reeser, Paul F. Tompkins, J.K. Simmons and John Hodgman. Fans know and love songs Andy has written with his collaborators Ben Acker and Ben Blacker. Some of the songs that they can’t get out of their heads are “Captain Laserbeam,” “Colonel Tick Tock,” “Jelly Beans,” “I Don’t Want No Trouble In My Place,” “King of Coffee Anthem,” “Poor Me, Pour Me Another,” “Jumbo,” “I’m Gonna Kill You Someday,” “Buddies,” “Written in the Stars,” “Woe Is Me,” and the Patriot Brand Cigarette jingle, to name a few.